Groceries cost less in Wisconsin than national average, according to Farm Bureau. 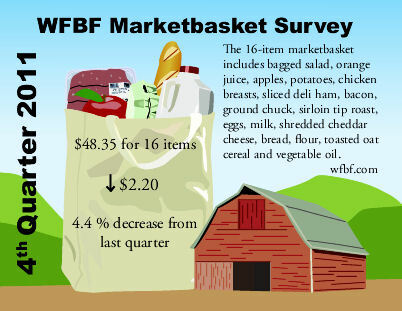 Retail food prices declined during the fourth quarter of 2011 according to the latest Wisconsin Farm Bureau Marketbasket Survey. The informal survey shows the total cost of 16 food items that can be used to prepare one or more meals was $48.35. It marked a 4%decrease from $50.55 in September. Despite the recent drop, Wisconsin's grocery prices saw a 6% increase over the course of 2011. Since the $45.61 average in December of 2010, the latest survey shows an increase of $2.47. "It appears the upward pressure on the food market that consumers saw over the last year has finally run its course," said Casey Langan, Wisconsin Farm Bureau spokesman. "Since 2010 we have seen food prices climb consistently from quarter-to-quarter for many of the food items in our survey. Strong global demand, weather extremes, high energy prices and a relatively weak U.S. dollar were all factors that drove steady price growth for many food items over the last two years," Langan said. John Anderson, a senior economist for the American Farm Bureau Federation says the pull-back from recent highs on most of the items in the survey suggests that food price inflation is slowing down substantially. "Some economists suggest 2012's food market could see less volatility with its inflation levels lowering to normal rates," Langan said. "The recent moderation of energy prices has certainly helped bring food costs down," he said. "However, energy prices remain the wild card. If we see a run up in the price of energy, then food prices will follow suit." Of the 16 food items surveyed by Farm Bureau members across the state, 10 decreased in price and two saw no change at all compared to the third quarter of 2011. Items that saw a decrease in price of 10% or more were apples, potatoes, bagged salad, bacon and flour. Just four items in the survey saw an increase from 2011's third to fourth quarter. Cheerios toasted oat cereal increased 22 cents (7%) to $3.25 per box. Sliced deli ham, sirloin tip roast and ground chuck all came in with increases of less than 5% over the last three months. The story is much different when comparing the prices for individual items over the last 12 months. Fourteen of the survey's 16 items saw price increases compared to one year ago. The highest percentage increases were for: whole milk (23%), bagged salad (15%), flour (12%), Cheerios (10%) and orange juice (10%). The two items that decreased in price over the last year were boneless chicken breast (13 percent) and a dozen large eggs (5%). Wisconsin's $48.35 Marketbasket is 88 cents less than the American Farm Bureau Federation's national survey of the same 16 food items. AFBF's survey rang in at $49.23. Despite the lower overall price, seven of the sixteen items recently surveyed in Wisconsin were higher than the national average: bagged salad, orange juice, bacon, shredded mild cheddar cheese, Cheerios, ground chuck, sirloin tip roast and boneless chicken breast. Bagged salad cost just one penny more in Wisconsin than the national average. Red Delicious Apples had the same average price in both the state and national surveys ($1.40 per pound). Over the last three decades retail grocery prices have gradually increased while the share of the average dollar spent on food that farm families receive has dropped. In the mid-1970s, farmers received about one-third of consumer retail food expenditures in grocery stores and restaurants. Since then that figure has decreased steadily and is now about 16%, according to the U.S. Department of Agriculture's revised Food Dollar Series. Using that percentage across the board, the farmer's share of this quarter's $48.35 grocery bill would be $7.74. Despite higher prices, the USDA says Americans will still spend approximately 10% of their disposable annual income on food, the lowest average in the world. The Marketbasket Survey is a quarterly look at the trends in food prices in Wisconsin in relation to changing farm prices, weather and wholesale and retail food marketing. Members of the Wisconsin Farm Bureau collected price samples of 16 basic food items in 25 communities across Wisconsin in December.